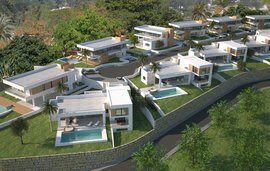 This brand new development offering 2 and 3 bedroom Apartments, penthouses and Town Houses is located on the New Golden Mile, to the west of Marbella. 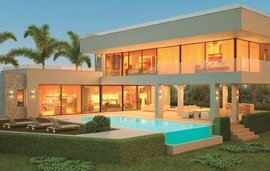 Neighbouring the well known area of Los Flamingos and minutes away from the Spanish Village of Cancelada, as well as being very close to a variety of golf courses, this new development is extremely well located. As well as stunning sea views the owners will also have access to an exclusive Club House boasting fantastic social and wellness facilities including an indoor pool, sauna and on-site cafeteria. The design of the apartments is open plan and they will feature large terraces from where you can enjoy the spectacular views. The large glass doors in the living room allow the natural light to flood in and enhance the spacious interiors. All the apartments have a different configuration, but the bedrooms boast fitted wardrobes and an en-suite double bathroom with the master bedroom also having a walk in dressing room. The apartments will also have a modern fully equipped kitchen with high gloss white units. The penthouses will have a stylish rooftop solarium. Designed for convenience, comfort and security some of the outstanding features are air conditioning and secure underground parking, open plan layout, porcelain floors, large private terraces and oversized windows. Please ask us for the availability and floor plans of these wonderful modern apartments and penthouses. Building is expected to start before the end of 2018 and completion by the end of 2020.